I enjoy making healthy meals for my family. We are all about fats that are good for you! No rancid, genetically modified corn, soy, or canola in this house. 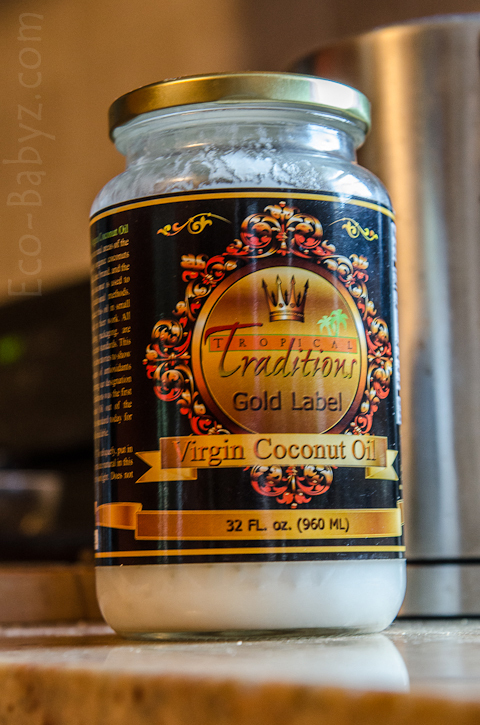 My kitchen is always stocked with some Organic Virgin Coconut Oil and right now it is this one from Tropical Traditions. I discovered coconut oil when I switched from toxic non-stick pans to stainless steel and couldn't find anything that would alleviate the burning and sticking (before I got a GreenPan). Butter would make everything stick and burn really bad and then I discovered coconut oil and was amazed! I could finally make pancakes and crepes without vowing I'll never do it again. I love the subtle taste of Tropical Traditions coconut oil, depending on the dish you are making it is barely noticeable or even not at all. I usually use it when making an omelette, pan frying meat, pancakes, crepes, or sauteing a side of veggies. I love the high smoke point, it just makes sense when you are using it for high heat purposes. I highly recommend trying coconut oil if you haven't already, it has many uses. You can even use it for skin care and not necessarily cooking! This one quart jar is so huge, it seems to last forever - so there is enough for any use you dream up. I'd love to try the Powdered Laundry Detergent. I have and love their Laundry Detergent! The coconut cream concentrate is GREAT! I like their coconut flour. I like the Virgin Coconut Oil Hair Treatment. I would like to try their organic raw freeze dried strawberries. I love their Coconut Oil! Definitely their coconut oil is my favorite! I use coconut oil daily and would love to try their Organic Gold Label. And the Baby Silk Moisturizing Cream sounds wonderful! Winning would be a nice summertime gift. My favourite product is their all purpose cleaner. I love it! My favorite it the gold label coconut oil. My favorite so far is the expeller pressed coconut oil,(which doesn't have the coconut flavor). I love to scramble eggs in it since I prefer eggs without the coconut flavor. I haven't tried the Gold Label yet, but am looking forward to it, since I do love coconut with other things. I know it's very beneficial. My friend eats coconut oil with a spoon and says it helped her lose weight. I just placed an order to try new things with Tropical Traditions. Thank you for your giveaway! they have some of the best tasting coconut oil around. I love the Gold label. coconut oil, it's my new fascination!